A cold snap recently struck the Dallas-Fort Worth area and morning temperatures at the University of North Texas in Denton ranged anywhere from single digits to the mid 20s. Despite the blustery weather outside resembling the inside of a freezer, sales on campus were still brisk for an unlikely treat — ice cream. 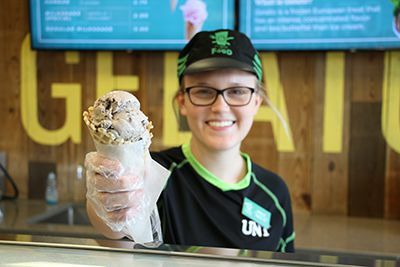 With the warm and sunny days of spring just around the corner, UNT’s Scrappy’s Ice Cream shop will soon be serving up even more of the delectable treat on campus as students search for ways to chill out and relax during their busy days. Located inside the Corner Store on the first floor of the University Union, Scrappy’s Ice Cream offers students and the local community a premium treat made fresh on campus at a great price. A generous scoop of ice cream costs just $1 and is available at the counter or in pre-packed to-go cups. Rich gelato starts at $2.50 a scoop, and creamy, made-to-order milkshakes are offered for just $2. Bill Hunter, Dining Services’ Master Baker, oversees the production of Scrappy’s Ice Cream at Clark Bakery. He’s confident once customers give Scrappy’s a try, they’ll be hooked. And patrons on campus are taking notice. Named after UNT’s mascot, Scrappy the Eagle, Scrappy’s Ice Cream was developed by UNT Director of Resident Dining Peter Balabuch and cafeteria crew members after attending Malcolm Stogo’s Ice Cream University in Florida in early 2012. Equipped with a brand-new Emery Thompson batch freezer, the team first offered their ice cream to dining hall customers at Kerr Cafeteria. After feverishly serving about 52 gallons of ice cream a night and receiving rave reviews, UNT Dining officially launched the brand for sale at their retail locations later that fall. Scrappy’s underwent renovations this past summer and reopened in mid-August, just in time for the start of the fall semester. The cosmetic improvements were designed to clearly define the space and attract hungry students to the ice cream counter. Customers noticed not only the improved look of the shop, but the updated packaging, labels and advertising as well. The completely new brand identity for Scrappy’s was designed to be eye-catching, appetizing and professional, while still maintaining the fun personality that the college’s mascot is known for. Despite all the visual changes, customers can rest assured that Scrappy’s still uses the original all-natural recipe that consists of a dairy blend, sugar, and eggs. The creamy delight is regularly offered in vanilla, chocolate, strawberry, cookies and cream, chocolate chip, mint chocolate chip, and cookie dough. Specialty flavors are also produced at various times throughout the year. Customers were delighted with Spiced Pumpkin Sweet Cream during the fall. Currently, students are enjoying Eggnog Ginger Snap and Peppermint Crunch ice cream as a winter limited time offer. Other original flavors created at UNT include Sweet Orange Chocolate Crunch, Dark Chocolate Lemon Crunch, Candy Ginger, and even Kulfi, a traditional Indian ice cream. But according to Balabuch, the most popular flavor—made only once a year—is the Honey Sunflower ice cream that is distributed at UNT’s EarthFest in April. In all, roughly 300 gallons of ice cream are specially made for events on campus, including the annual Mean Green Fling and Founder’s Day celebrations. But sometimes, deciding on what flavor to eat can be the biggest struggle for those on campus. 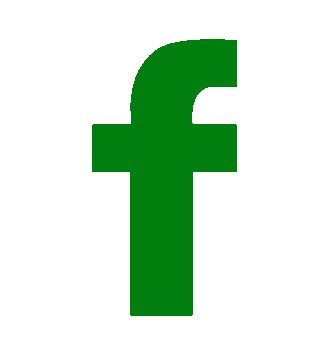 UNT Dining is the largest self-supported food service department in North Texas. With our 22 retail food shops, five cafeterias, a full-service restaurant, and a catering department, we serve nearly five million meals annually. Our food service program is award-winning and has been recognized nationally by organizations like Food Service Director Magazine, Physician’s Council for Responsible Medicine, and PETA. We are also the recipient of the prestigious Loyal E. Horton Award from the National Association of College and University Food Services. In 2011, Mean Greens Café opened as the first all-vegan university dining hall in the country. For more information, visit http://www.dining.unt.edu/.